I Ran a 5k Today!!! Seriously! Doesn’t that sound AMAZING?!?! Truth be told, I’ve done it before… just didn’t ever pay attention to the fact that 5k was equivalent to 3.1 miles and some change. But, regardless…. Today I participated in Automattic’s Worldwide WP 5k. And let me tell ya, I’m really quite proud of myself with my accomplishment. The powers that be at WordPress came up with the idea of “organizing” a 5k amongst their staff and WordPress users all over the world and today was the day. Pretty freaking cool. Usually when I go out for a jog, I alternate intervals of jogging for a minute and walking for two. Several years ago, I jogged 4 miles every day faithfully but fell off the wagon somewhere along the way. Recently I started getting back out there and while my times are no where near what they used to be, I was quite pleased with how well I did given how long it had been. I jogged mile 1, RAN mile 2 and jogged the 3rd as the additional .4 mi to get back to my starting point. My total time being 41:29. AND not only did I RUN the 2nd mile, it was my fastest mile ever with a time of 12:24. Maybe it was because I was “participating” in the WordPress 5k versus just going out for a 3 mile jog. Maybe it was because I went back to my old jogging route from those several years ago. Maybe I was just a bit more determined today. I don’t know, but really don’t care either because it feels really good! I realize that to many of the more seasoned, trained runners, this may not seem too big a deal, but for me this was pretty awesome. I’ve never considered myself to be a runner. I always categorized myself as a jogger/walker, but NEVER a runner. I was never a distance runner or a speed runner. I just went about my merry way. TODAY, though it felt so incredibly awesome to be out, jogging and running along my old route. It just felt good to accomplish something such as setting a new record without even intending to do so. I RAN an entire mile… How freakin’ cool is that??? I felt like I was gonna die afterwards in all honesty…. I sat down and found myself giving thanks up there. For me, it’s pretty awesome my friends. Still not convinced though that I would classify myself as a runner, but a blogging buddy shared this picture with me a while ago and reminded me of the quote as I compared our 5k times today. Thanks buddy! Does this make me a runner then??? So, hmmm. Maybe I am a runner? Eh. I dunno. Does it really matter? No, I guess not so much. BUT, TODAY, I am a runner. and then ate a super yummy salad! 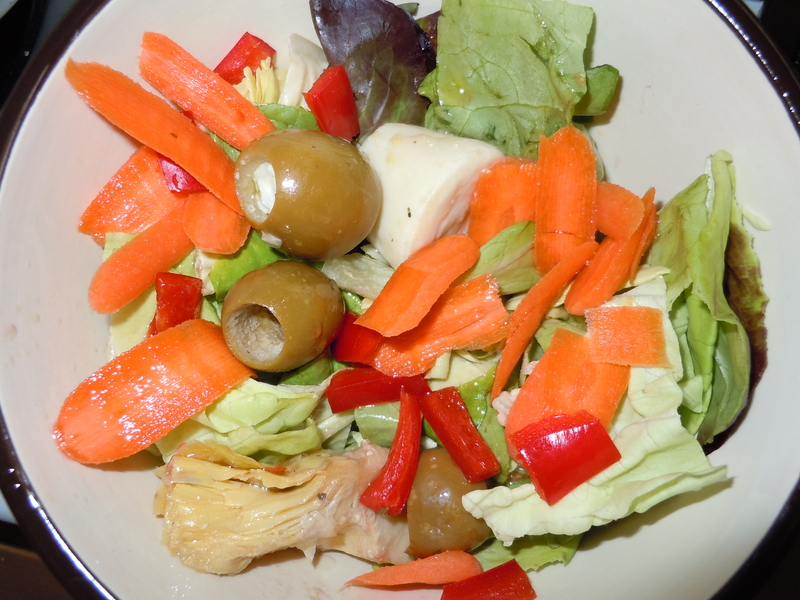 Sweet butter lettuce, red peppers, feta stuffed olives, artichoke hearts and carrots with homemade red wine vinaigrette dressing. Also had a little bit of humus and carrots to finish up my dinner. Good stuff!!!! AND I ran in a 5k! Tired of hearing me say that yet?????? What was something that really made you proud of yourself? Enjoy the moment and accomplishment. Rave on! Something that made me proud of myself? This “rebel without a cause” from the ’50’s walked onto a college campus at 62 years of age and received his Associates Degree in Science (Nursing) two years later and did it with a 4.0 GPA. What a Hoot! So proud of you! You are definitely runner. The times will come down, but the important part is to get out there. Thanks so much Rick! Appreciate your encouraging words… If you say I’m a runner, I must be a runner 🙂 I’ll keep at it. Good for you!!! That is awesome…and your dinner looks AMAZINGLY delicious!!! It was soooooo tasty that I had it again for dinner tonight! Thanks chica! Glad to know I’m not alone Nicole! It is soooo hard getting back into it, but it did feel wonderful. Good to know I can do it 🙂 Good luck to you chica! Thanks Melissa 🙂 I still can’t believe I did it! LOL Maybe it was a fluke! Thanks my dear… Not too long ago I wouldn’t have been able to do so either! You did very well. Call yourself a runner if you wish… Just do it.